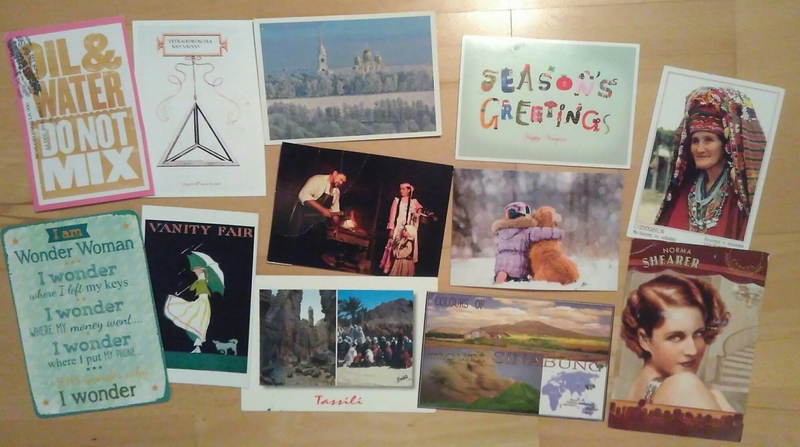 I got home just before New Year to a letter box full of postcards! The two typography cards on the left, and the Vanity Fair cover card came from a Swap-bot ‘Postcard Roulette’ swap. The first partner was assigned, then all of the addresses were sent out for people to send another card (or more). I did wonder before choosing a second address if more cards would be sent to addresses in unusual countries, or within countries to save on postage, or if there’s much of a pattern… I clearly over thought the whole thing 🙂 I’ve received 2 from USA and 1 from Netherlands. The da Vinci sketch is from a postcard pal now based in London. The snowy cathedral is from a Russian postcard pal. The scene with the blacksmith is from a Postcrossing meet-up in Kazan, Russia, but sent through Postcard United – I’m clearly not the only one sending through both now! The bottom middle card is my first card from Algeria. My French is s bit rusty but it’s a UNESCO site and something to do with lots of museums and civilisation in the Sahara. Seasons Greetings is made of animals and comes from Netherlands. The girl with her dog come from a pal in Hong Kong. And Mount Sitabung is in Indonesia (sent with a short stamped message). 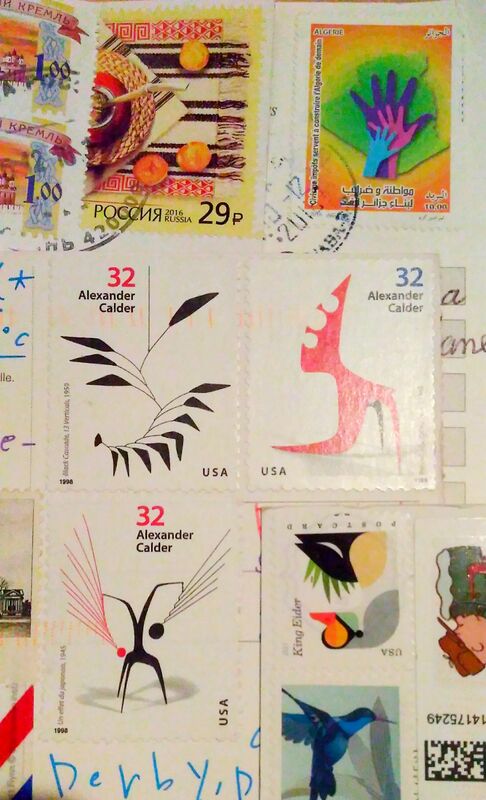 Also, I’m loving the Alexander Calder stamps! This entry was tagged Postcards, Postcrossing, snail mail, Swap-bot. Bookmark the permalink. Hard to pick the best one out of them – all are so wonderful in one way or other. Can’t wait to have mine entry there as well..